Our first two posts of the offseason have examined the American Athletic Conference. Now we turn our attention to the Atlantic Coast Conference. Here are the ACC Standings. So we know what each team achieved, but how did they perform? 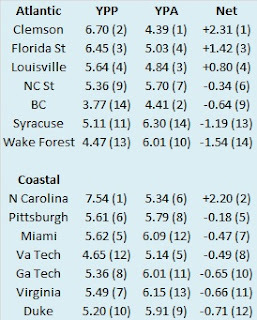 To answer that, here are the Yards Per Play (YPP), Yards Per Play Allowed (YPA) and Net Yards Per Play (Net) numbers for each ACC team. This includes conference play only, with the championship game not included. The teams are sorted by division by Net YPP with conference rank in parentheses. 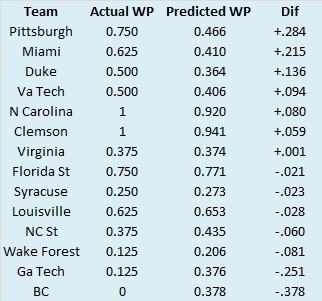 Georgia Tech and Boston College under-performed based on their YPP numbers while Pittsburgh and Miami produced better records than one would expect. Georgia Tech entered the season with great expectations after playing in the ACC Championship Game and winning the Orange Bowl in 2014. The Jackets dominated a pair of over-matched foes to begin the year and rose to number 14 in the AP Poll. Then, they encountered a scenario that would play out multiple times in 2015. Their offense was held in check by a competent team (this time by Notre Dame) and they lost a one-score contest. The Yellow Jackets went 1-4 in one-possession ACC games, and if we include their non-league losses to Notre Dame and Georgia, their overall mark in close games was just 1-6. Couple that with a turnover margin of -8 in ACC play (tied for last in the conference), and it becomes clear why the Yellow Jackets disappointed in 2015. However, the one tight game they did manage to win may have been worth the other six losses. Boston College wasted a fantastic defense by fielding one of the worst offenses of the modern era (we’ll discuss them more in depth next week). They also struggled in close games, with half of their league losses coming by three points or less. 2015 was an interesting year for Miami. After posting the best YPP differential in the ACC in 2014 (and finishing 3-5), Al Golden was squarely on the hot seat. The Hurricanes opened ACC play 1-2 and Golden was canned. The Hurricanes proceeded to win four of their last five games under interim coach Larry Scott, including one in very dramatic fashion. 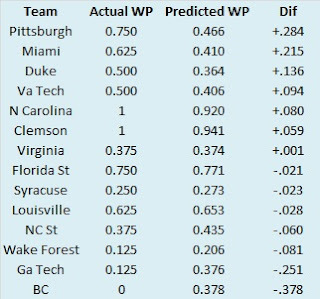 The Hurricanes finished 3-1 in one-score ACC games, but I think the main reason for the disparity between their YPP and their conference record was the way they played in two of their losses. I rarely question the effort of football players as they are tougher than I could ever hope to be, so I don’t know if the Hurricanes were apathetic against Clemson and North Carolina, but they lost both of those games by a combined 96 points. Those two poor performances do a good job of anchoring their overall YPP ratings. Finally, Pittsburgh enjoyed the largest positive disparity between their YPP and overall record. The Panthers seemed set on being the Cardiac Cats in their first season under Pat Narduzzi. Including their non-league clashes with Youngstown State and Iowa, seven of the Panthers’ first eight games were decided by one-score. The Panthers won their first four league games by a combined 17 points to put themselves in contention for the Coastal Division crown. They lost their last two one-score games to drop out of the race, but posted their first winning league record since 2011 when they were still members of the Big East. Next week, the ACC gets the APR treatment, and we'll take a closer look at Boston College and their poor offense/strong defense combination. 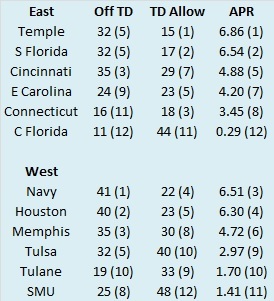 Last week, we looked at how AAC teams fared in terms of yards per play. This week, we turn our attention to how the season played out in terms of the Adjusted Pythagorean Record, or APR. For an in-depth look at APR, click here. If you didn’t feel like clicking, here is the Reader’s Digest version. APR looks at how well a team scores and prevents touchdowns. Non-offensive touchdowns, field goals, extra points, and safeties are excluded. The ratio of offensive touchdowns to touchdowns allowed is converted into a winning percentage. Pretty simple actually. Once again, here are the 2015 AAC standings. 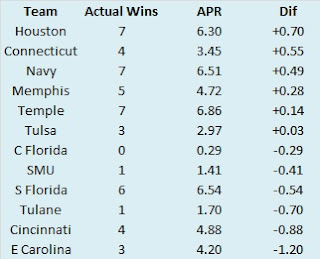 Finally, the AAC teams are sorted by the difference between their actual number of wins and their expected number of wins according to APR. 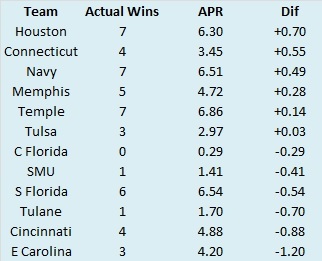 In 2015, no AAC team drastically over or under-performed their APR. East Carolina came close to significantly under-performing, but the threshold I set was a game and a half. Plus, we already delved into the reasons East Carolina failed to win as many games as we might expect from their underlying performance last week. With no teams performing significantly better or worse than we would expect from their APR, I decided to take a closer look at the South Florida Bulls. Willie Taggart entered the 2015 season (justifiably) on the hot seat. After rebuilding Western Kentucky into a solid mid-major, he headed southeast to Tampa, and early returns were not promising. His first two South Florida teams posted a combined 6-18 record (5-11 in the American Athletic Conference), lost in blowout fashion to an FCS school, and had a real hard time moving the ball and putting points on the board. 2015 also began rather inauspiciously. The Bulls opened with an expected win over Florida A&M from the FCS and then were moderately competitive against the gold standard program in the Sunshine State. However, any goodwill quickly evaporated when the Bulls lost to Maryland by 18 points. Keep in mind this Maryland team was quite poor, firing their coach midway through the season and finishing just 3-9. In fact, their win over South Florida represented their largest win over an FBS opponent in 2015. The Bulls also lost their next game, although it was a sign of things to come as they were competitive against Memphis, one of the league’s better teams. Still, the Bulls scored only 17 points against the Tigers, continuing a discouraging offensive trend. The Bulls bounced back in their next contest, a home non-conference clash with former Big East member Syracuse. The Bulls put 45 points on the Orange, the most they had scored against an FBS opponent since dropping 52 on UTEP during their hot start to the 2011 season. Upon returning to league play, the Bulls would win three of their next four games, losing only to Navy, while averaging a healthy 26.3 points per game. Then, over the final three games of the regular season, the Bulls would reach another level. The Bulls scored a combined 153 points in victories against Temple, Cincinnati, and Central Florida to cap off an eight win campaign. Based on the way the Bulls were performing, they were practically playing a different game than when Taggart first arrived. Consider that in their first ten conference games under Taggart the Bulls scored a grand total of 141 points! I can’t really describe how much better South Florida was offensively in their third season under Taggart, so I will use a table. The table below gives data on the offensive touchdowns, yards per play, and points scored by South Florida in conference play during each of the three years of the Willie Taggart era. The Bulls scored more offensive touchdowns and total points in 2015 than they did in 2013 and 2014 combined. I certainly did not see this outburst coming, but the unpredictability of college football, and sports in general is what makes it great. College football's offseason is among the longest of all sports. Except for the World Cup or Olympic Games, no other sport makes you wait longer between the end of one season and the beginning of another. To pass the thirty something weeks before college football returns, each of the ten FBS conferences will get two posts (one per week) reviewing the season that was in terms of Yards per Play and Adjusted Pythagorean Record. We won't play favorites in terms of Power Five versus Group of Five, as we'll tackle each league in alphabetical order. We begin with the American Athletic Conference. Here are the AAC standings. So we know what each team achieved, but how did they perform? To answer that, here are the Yards Per Play (YPP), Yards Per Play Allowed (YPA) and Net Yards Per Play (Net) numbers for each AAC team. This includes conference play only, with the championship game not included. The teams are sorted by division by Net YPP with conference rank in parentheses. College football teams play either eight or nine conference games. Consequently, their record in such a small sample may not be indicative of their quality of play. A few fortuitous bounces here or there can be the difference between another ho-hum campaign or a special season. Randomness and other factors outside of our perception play a role in determining the standings. It would be fantastic if college football teams played 100 or even 1000 games. Then we could have a better idea about which teams were really the best. Alas, players would miss too much class time, their bodies would be battered beyond recognition, and I would never leave the couch. As it is, we have to make do with the handful of games teams do play. In those games, we can learn a lot from a team’s YPP. Since 2005, I have collected YPP data for every conference. I use conference games only because teams play such divergent non-conference schedules and the teams within a conference tend to be of similar quality. By running a regression analysis between a team’s Net YPP (the difference between their Yards Per Play and Yards Per Play Allowed) and their conference winning percentage, we can see if Net YPP is a decent predictor of a team’s record. Spoiler alert. It is. For the statistically inclined, the correlation coefficient between a team’s Net YPP in conference play and their conference record is around .66. Since Net YPP is a solid predictor of a team’s conference record, we can use it to identify which teams had a significant disparity between their conference record as predicted by Net YPP and their actual conference record. I used a difference of .200 between predicted and actual winning percentage as the threshold for ‘significant’. Why .200? It is a little arbitrary, but .200 corresponds to a difference of 1.6 games over an eight game conference schedule and 1.8 games over a nine game one. Over or under-performing by more than a game and a half in a small sample seems significant to me. In the 2015 season, which teams in the AAC met this threshold? 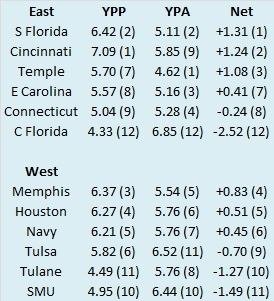 Here are the AAC teams sorted by performance over what would be expected from their Net YPP numbers. Before we get started, no, that is not a typo in the table. Based on their poor performance, the regression analysis would have expected Central Florida to win slightly fewer than zero games. 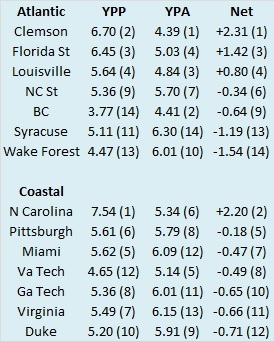 Cincinnati and East Carolina under-performed based on their YPP numbers (and Ruffin McNeil lost his job because of it) while Houston and Navy produced better records than one would expect from their Net YPP numbers. For Cincinnati and East Carolina, the usual suspects were in play here. Both schools combined for a 1-5 record in one-score games. If both teams had won half of their close games as we would expect in the long run, their records would have more closely matched up with their YPP numbers. Cincinnati also had a big problem with turnovers, finishing with a margin of -12 in league play (second worst) that contributed to their disappointing season. For Houston and Navy, you have to dig a little deeper to find answers for their success. Houston went 2-1 in one-score games, which hardly implies they were extremely lucky, while Navy did not play any close games in the AAC. For Houston, their overall offensive numbers are depressed by their performance in their only loss when quarterback Greg Ward Jr was injured. In their other seven games, their offensive numbers would have ranked second in the AAC. For Navy, the reason for their difference in record is turnovers, pace, and capitalizing on scoring opportunities. The Midshipmen committed just three turnovers in their eight conference games and their margin of +11 led the AAC. While Navy’s defense was about average in the AAC in Yards per Play Allowed (seventh), they faced the fewest plays of any defense in the AAC thanks to Navy’s ball control offense. Navy faced about seven fewer plays per game than the average AAC defense and about 17 fewer per game than lightning fast Tulsa. Limiting possessions can ‘hide’ a defense and mitigate the impact of lacking an elite unit. They also ranked first in the AAC in offensive touchdowns despite ranking fifth in yards per play. 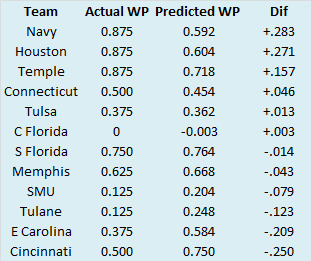 Navy was able to finish drives and score more points than would be expected based on their per play averages. Next week, the AAC gets the APR treatment and we'll also take a closer look at the rise of South Florida.